How can loving good fashion be about doing social good? What Ken Be Done mobilises fashion creativity, colour and fun to raise money for The Social Studio. 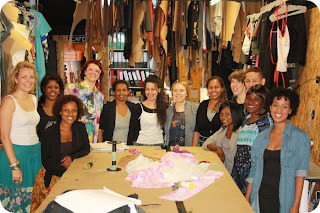 The Social Studio is a dynamic space where clothing is created from the style and skills of the young refugee community. Recycled and excess manufacturing materials are gathered from local industry and re-configured into original clothing. The Social Studio is based in Melbourne, Australia. The Social Studio is a safe place of belonging that strives to create awareness and change public perceptions for people who have experienced being a refugee. They facilitate a range of projects that provide social support including legal advice, counselling, tutoring, driving and formal training in clothing production, retail and hospitality. The Studio also enables community engagement through its café, regular public workshops, talks and events.